The most disturbed horror series of all time returns with an all-new seven-issue series written by David (Crossed: Family Values) Lapham! Meet Mr. Lorre --a single, horribly selfish, man trying to survive on his own. A man who will leave behind every shred of his humanity to survive the Crossed. Now join us as Lapham and artist Raulo (Capt Swing) Caceres descend into a story about the worst aspects of human behavior, a tale of unspeakable evils, violent assaults on both mind and body, and of longing for death and the sweet release it will bring. Imagine, for a moment, the worst crimes against humanity. Picture the cruelest affronts to decency. Conjure your darkest nightmares... and then realize it could all be so much worse. When civilization crumbles in one terrifying moment; when people are gleefully breaking into unthinkable acts of violence all around you; when everyone you love has died screaming in agony: What do you do? There is no help. There is no hope. There is no escape. 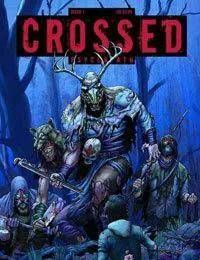 There are only the Crossed.